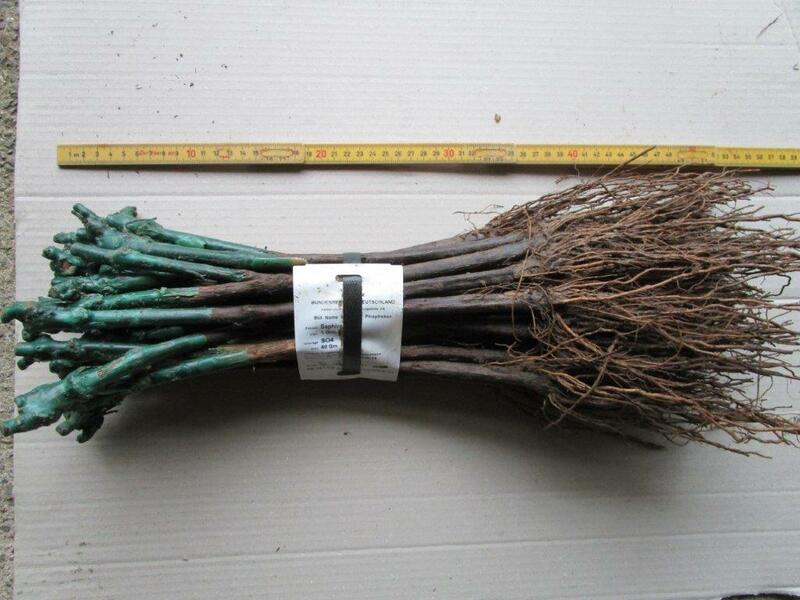 a bundle of 25 grafted vines, about 54 cms long, with EC Plant Passport. The vine stock consists of the scion (a bud from the vine variety) and the rootstock (which is resistant to the phylloxera louse). The scion is about 2.5 cms long and is attached to the long rootstock by a 'nobbly' omega-graft. The top growth of the vine has been cut back and double-waxed. The 'twig' at the top has been pruned to leave 2 buds; the lower of these buds is the one that will grow to be the main stock, the upper bud will grow more strongly initially but would be much weaker later. The wax should be left in place as it protects the scion from drying out. The new buds will push through the wax. If it's late in the season and there are small buds already growing these should be rubbed off (they will die back anyway if left on) new buds will grow after planting. Try to avoid late planting in light soils as the plants will not have the time to make enough roots to support a very dry summer. The roots have been cut back to 'a hands' breadth' (about 15 cms). They can be pruned further but leave them as long as the planting hole will allow; the roots hold a lot of reserves. Freshly cut roots are beneficial for early root development. During the day before planting, stand the bundles of vines in buckets of fresh water, with roots covered by the water, and leave them for up to 24 hours (maximum) to take up any water they need. Allowing vines to 'dry out' in the days before planting is the main cause of 'failures', the only other real reason is a 'faulty' graft but this is very rare. When planting, do not leave the vines, or the sacks of plants laying out in hot sun! When planting, the graft must be at least 5 cms above the final soil level, preferably 7 cms, in order to prevent the scion from ever forming its own roots, which would result subsequently in the vine dieing. The graft should not be more than 10 cms above soil level, as the roots of a young vine can dry out more easily if they are closer to the surface. Dig a hole, about 48 cms deep and 20 cms diameter. A little slow-release fertilizer (phosphate and sulphate of potash) can be sprinkled around the bottom of the hole; Muriate of Potash must never be used, as vines cannot tolerate chloride ions. Do not put nitrate or enriched soil in the hole as there is a risk of burning the roots. Make a small mound of top-soil at the bottom of the hole, place the bottom of the rootstock on the top of the mound, and spread the vine roots so that they point outwards and downwards in a cone shape. Push soil back over the roots and gently 'firm in', then refill the hole with soil, gently firming the soil down as you do it. While doing this - break in the sides of the hole so that there is no 'flower pot' effect that might cause the roots to grow in a circle rather than downwards and outwards. Never push the soil too heavily on the roots, particularly with wet soil, as it will compact causing root asphyxiation. Subsequent watering is always welcome even in humid ground. A newly planted vine takes about two weeks before buds start to grow; this is due to the 'shock of transplantation'. - a stable soil, which will support the plant and put nutritive elements at it's disposition. The young plant must have a good contact with the soil. - a humid environment (but without excess water) to feed the plant and carry nutritive elements around. - an airy environment. This last point is very important but sometimes neglected outside the planting. The vine-roots have an indispensable need for oxygen to develop. Problems of poor growth in certain new plantings almost all originate from lack of air in the soil which leads to the asphyxiation of the roots. In order for soil to be well aerated any excess water must drain off well. In a healthy soil it is little channels which drain the water towards the subsoil. After rain the water fills these channels and chases out the contaminated air which is there. As the water withdraws, fresh air is inhaled and creates an aeration. In young plantings the soils are freshly worked and these little channels are not yet in place. The soil then acts as a sponge, does not drain the excess water and does not inhale fresh air. Then only evaporation can drain off the excess water. So in years when the spring rain is too frequent, and the soil remains saturated, the result is limited growth in young plantations, even more noticeable in heavy soils. For replacements of failures (in existing vineyards) one must make a large hole and leave the roots long so that they can better compete with the roots already there. Once the vines have started to 'wake up' in the springtime it is not possible to then put them into a cold-store (between 1 and 3 °C is necessary to keep vines dormant). If you do then they will die. If plants have been kept in a cold-store they must always be planted in springtime; if they were to be planted in September/October they would quickly 'wake up' and the shoots would not be developed and ripened sufficiently for the plants to survive the winter. Dig a trench at a convenient location where the vines can be watered regularly. Along one slightly inclined side place the vines individually in a row 3 cms apart. You can then put soil to cover the roots of these and make another row alongside, continuing until a block has been built up. Alternatively you can plant the vines in 'pots' of 1 or 2 litres volume, let them grow outside and water them regularly, so they can be planted out subsequently in the summer or autumn, when time and conditions permit.